TenneT is preparing the Dutch electricity grid for the future. New high-voltage connections, Wintrack masts, have been developed for this. VolkerWessels Telecom was contracted by TenneT to provide delivery and assembly of the masts. Eurosafe Solutions has provided the fall protection for these Wintrack masts. In order to be able to maintain the Wintrack pylons safely and efficiently, TenneT has been looking for sustainable and user-friendly climbing and safety solutions. The Solutions must be able to allow the worker to climb safely inside the masts and to be able to carry out work responsibly on the outside. After all, safety at the top is key. TenneT selected the high-quality HighStep Rail system for safely climbing the masts on the outside. On the inside, the solution provided was the sustainable MSA Latchways LadderLatch cable systems . VolkerWessels Telecom, responsible for the construction of the Wintrack mast, then went in search of a reliable partner to install these systems safely and in accordance with the regulations. Eurosafe Solutions was employed as a specialist in safe working at height with a proven track record. 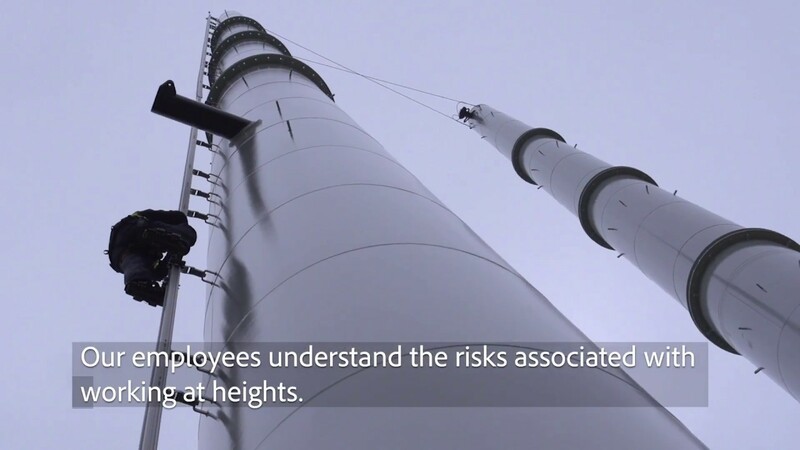 Eurosafe Solutions and VolkerWessels Telecom work closely together when it comes to safe working at height. This assignment therefore fitted seamlessly with that. Where VolkerWessels Telecom designs, builds and maintains well thought-out and future-oriented telecoms infrastructures, Eurosafe Solutions offers support in creating a safe situation for work at height. Trained Eurosafe Solutions staff to assemble, inspect and maintain HighStep and Latchways systems. The Dutch electricity grid is an important link in the North European electricity network. There are three connections with Germany, two with Belgium, one with Norway and one with England. The further development of a single North-West European electricity market. Such a market is an important goal of the European Commission and of the Minister of Economic Affairs. With sufficient transport capacity, electricity can be generated at the place where it is cheapest. The new connection is needed to enable the Netherlands to play along as well as possible. The importance of Doetinchem-Wesel 380 kV has been recognized by the EU, which has regarded it as a ‘Project of Common Interest’ . The reliability of the electricity system. If, for example, a large power plant fails in the Netherlands, other power plants must immediately absorb this. This can be a central location in the Netherlands, but also abroad. That is why it is important that there are sufficient national and international high-voltage connections. More space for sustainable electricity. Electricity is increasingly being generated with sustainable sources such as wind turbines and solar panels, both in the Netherlands and in other European countries. However, the yield of wind and solar energy is not constant. If the wind is not blowing or the sun is not shining, the production will remain low. Then the demand for electricity must be met quickly in a different way. For this too, it is important to have good national and international high-voltage connections. For more information on this project or solutions please get in touch. . .
© 2019 Eurosafe Solutions. All rights reserved.